Having a way to get yourself out of the elements and keep warm is a priority in any survival situation. Hypothermia is a killer and can set in quickly without you realizing it, even in relatively moderate conditions. The Land Shark Instant Survival Shelter is sort of an emergency blanket on steroids. It is comprised of a composite, ripstop material with a lamination of aluminum film. It is much thicker than the average emergency blanket. It is both waterproof and windproof. One side of the shelter is printed with a digital camo print and the other is a solid blaze orange. It arrives in a pouch that is about 8.5 inches by 7.5 inches and less than an inch thick. Deceptively small, given the actual size of the shelter is large enough to provide shelter for someone up to 6’3″ and 300+lbs. Opening the pouch reveals a vacuum-sealed plastic bag with the shelter inside. There are also two thick paper cards, with brief instructions for use on land and on sea. As soon as I sliced open the vac-sealed pouch, I knew there was no way this thing was going to fold up small enough to fit back into the carrying bag. Unfolding the shelter, it is basically a very large bag with a drawstring top. Completely unfolded, it measures 38″ x 80″, so it is plenty big. Attached to the drawstring are a survival whistle and a clip you could use to attach multiple shelters together if lost at sea, to keep everyone together. 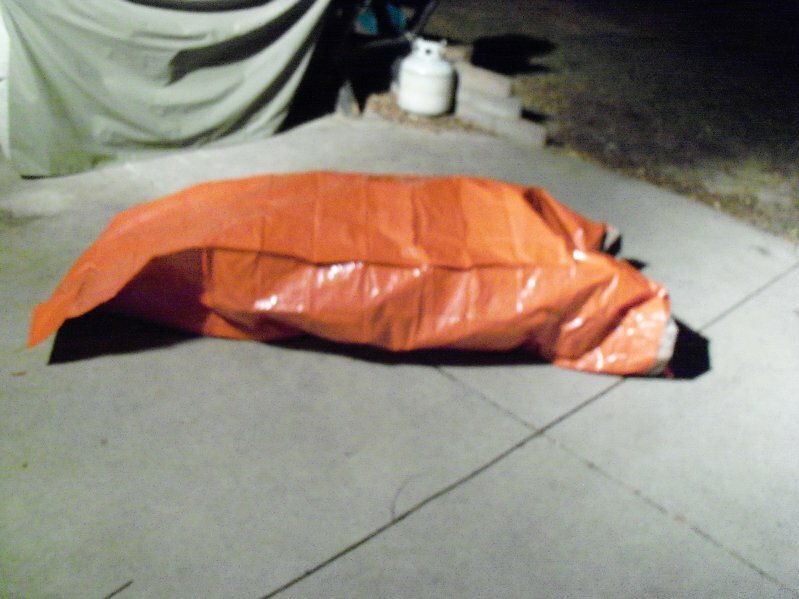 I took the Land Shark Instant Survival Shelter outside a few nights ago and crawled into it. The air temperature was around 15F. I was wearing a long-sleeve T-shirt, fleece lined flannel jacket, pants, socks, and hiking boots. I found the easiest way to get into the shelter was to step into it, sort of like if I were preparing to engage in a potato sack race, then pull the shelter up over me. I’m 5’10” tall and the shelter completely covered me with plenty of room to spare. Here, I’m standing inside the shelter, holding the top as high as I can reach. Within just a few minutes, I could feel the inside of the shelter warming up a bit. It had immediately stopped all wind from reaching me. I can’t say it ever reached sauna conditions inside the shelter but it most certainly kept me plenty warm. That said, there is no insulating aspect to this shelter. By that, I mean that laying on the cold ground, you can feel that cold seeping into you. Some sort of insulation between you and the bare ground, such as leaves or pine boughs, would be necessary to keep you warm through the night. The $10,000 question, though, is — Does it work? I’m confident that this survival shelter would keep you warm and dry overnight, doing a better job than many of the emergency blankets on the market today. Given the size of the shelter, you can easily wrap yourself up in it completely, closing off all drafts, to keep you toasty warm. The Land Shark is also suggested for use in the water, such as if a boat sinks. Given that the shelter is designed like a bag, as long as you keep the open end above water, you’ll stay reasonably dry. As an added bonus, any wounds that are bleeding won’t lead to shark visits as the body fluids will stay in the bag. A 30-minute test using the highly rated FLIR, Inc. Model 2000AB helicopter-mounted IR detector, operating in the 8-14 micron wavelength range, failed to locate three individuals concealed in Land Shark bags. For those of you concerned about these types of searches, you could do much worse than investing in a Land Shark. Another feature I really appreciated with the Land Shark is that the seams are actually stitched, rather than just heat-sealed. This means all the seams are very strong and aren’t going to come loose at the worst possible times. There are a couple of downsides to the Land Shark. First, as I mentioned earlier, there is no way you will be able to get this shelter to fit back into the original bag, at least not easily. It expands a fair amount once it is out of the vac-sealed plastic. Don’t get me wrong, you can still fold it up for storage but it isn’t going to be less than an inch thick like it was originally. It is also rather noisy when you move around in it. The plastic material is similar to a tarp in thickness and feel. Shaking out the shelter or crumpling it in your hand is noisy, no two ways about it. All in all, the Land Shark lives up to the claims the company makes and would be a great benefit in a survival situation. It will keep you warm and dry while you wait to be rescued. Just don’t expect to fit it into a small pocket in your pack after you’ve used it.